“Genetically modified humans” sounds like a term that belongs in Hollywood, but it’s actually a very real possibility, and one that’s being heavily discussed in the scientific community. Contributing to one of the most controversial topics to date, a panel of science experts in the U.S. just examined and gave their support for germline editing. 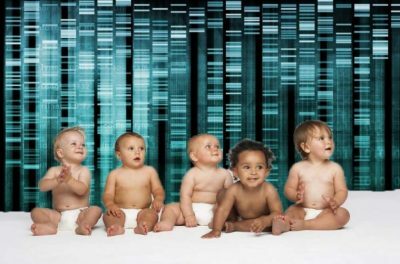 This means that in the future, parents will likely be able to tamper with the genetics of their children pre-birth. Germinal choice technology refers to reprogenetic technologies that enable parents to alter the genetic constitutions of their children. One of the ways this can be done is through germline editing, which is a fancier term for human genetic engineering. Germline editing alters the genes of a sperm or an egg, but it then changes the future DNA of every single cell in the embryo. This means that the genetic changes made to the embryos will then affect all future generations within that family lineage. The panels were made up of experts from two of the most prestigious scientific institutions in the U.S., both of which recommended that germline editing be viewed as a serious option in the future and not be prohibited outright (source). This is a dramatically different stance than the last assessment given in December 2015 by an international summit of scientists, who stated that it would be “irresponsible to proceed” with germline editing given the controversy surrounding the subject and the safety issues involved, all of which have yet to be resolved. The panels’ discussions can be further analyzed in a report released earlier this week by the U.S. National Academy of Sciences and the National Academy of Medicine. The panel recommended that germline editing of early embryos, eggs, or sperm should only be permitted to prevent serious disease or disability if there’s significant scientific evidence illustrating that the procedures are safe. Do benefits outweigh the risks? “Human genome editing holds tremendous promise for understanding, treating, or preventing many devastating genetic diseases, and for improving treatment of many other illnesses. . . . However, genome editing to enhance traits or abilities beyond ordinary health raises concerns about whether the benefits can outweigh the risks, and about fairness if available only to some people,” explained Alta Charo, co-chair of the study committee and Sheldon B. Lubar Distinguished Chair and Warren P. Knowles Professor of Law and Bioethics, University of Wisconsin-Madison. One of the illnesses the panel specifically mentioned that germline editing could be used to prevent is Huntington’s disease, a progressive brain disorder that can result in uncontrollable movement, emotional issues, and loss in cognition, most commonly appearing in a person’s thirties or forties. However, the panel was quick to note that with these alterations could come some very serious side effects. One of the potential risks includes developing new conditions, diseases, or mutations. If this happened, parents would have no idea until their babies are born and begin to mature. Perhaps the most obvious risk is the societal implications associated with the genetic engineering of humans. If it’s an expensive process, meaning it will likely only be made available to upper class citizens who can afford it, it could create a “designer class” of babies with preferred qualities and genes. “These kinds of scenarios used to be science fiction; they used to be seen as far-off hypotheticals… But actually, right now, I think they’re urgent social justice questions,” said biotechnologist Marcy Darnovsky from the Center for Genetics and Society to Rob Stein at NPR. Will Genetic Engineering Mark the Birth of Transhumanism? Transhumanism is a futuristic ideology which purports that humans will be altered and improved using sophisticated technologies in the future to upgrade our intellectual, physical, and mental capabilities. Many scientists are actually in favour of this, especially as we become more technologically advanced, making this seem more realistic. Elon Musk supports this movement, in fact, as he believes that human beings will eventually use technology to enhance our inherent natural capabilities. “Over time we will see a closer merger of biological intelligence and digital intelligence. It is all about the band width of the brain,” Musk said. “Some high band width interface to the brain will be something which helps achieve symbiosis between human and machine intelligence, which solves a control and usefulness problem,” he continued. Musk has spoken about this topic on several occasions. For example, last year he explained that we should consider getting brain implants in the future because, without them, we may not be able to compete with artificial intelligence (AI). He also has strong opinions about AI, arguing it could pose a threat to us if we become too dependent on it (source). I believe that genetically engineering human beings could serve us in a way, but it could also do more harm than good. Germline editing could seriously improve the lives of many if it could prevent certain diseases, but at what cost? In addition, the fact that a man and a woman can mate and create offspring together that’s made up of a mixture of their genes is truly beautiful. Do we really want to alter something that’s already such an incredible gift in nature? I don’t think there’s a right or a wrong answer here. However, there are certainly some risks involved with genetically modifying humans. It’s easy to imagine how the elite could use this to further manipulate the general population, or how it could create an even greater divide between high income and low income families. The idea of creating an Aryan or superior race could even be proposed again, which would only further perpetuate the illusions of separatism and hierarchy. Then again, it could potentially help us further advance our consciousness and awaken our inner capabilities, especially if the technology or alterations have absolutely no health risks (zero radiation/EMF exposure, no increased risk in disease, etc.). In either case, I believe our time would be better spent further advancing our collective consciousness. If that can be done through AI, then that’s incredible and I’m all for it. However, we must remember that, if we truly dial in and get in touch with ourselves energetically, we have the power to heal ourselves from within. We don’t need to rely on technology to save us and prevent diseases. Yes, technology plays an important role in society, but that doesn’t mean we should let it overshadow our own capabilities as spiritual beings.